Amazing Sound Quality... No reason to Pay $$$ for Over-Priced Branded Headphones! Dorm Co. Tip: Listen in Style & Comfort! Listening to music should be relaxing, but it will be relaxing only if you have the right headphones for college. Headphones that are either uncomfortable or make your music sound like it's under water are just no good. Since music should be something you can unwind to, you'll need to be comfortable and to be able to actually hear your music properly. To do so, add the right cheap headphones with these Foldable Studio Headphones. The padded cushions of these college headphones will bring more than enough comfort. 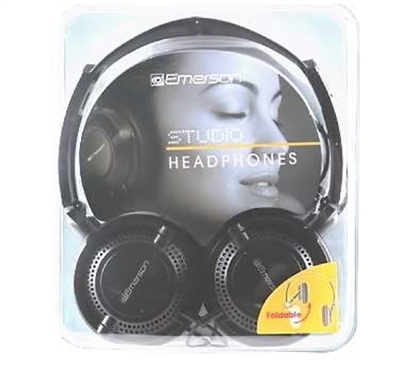 The ear cup portion is large enough to go over your whole ear, but not so large that your ears will be enclosed, such as with DJ-style headphones. As their name implies, these headphones for college students are foldable. This feature is ever-important, as space-saving college supplies make the best dorm products! You might not think headphones, even large ones, take up that much space, Still, those dorm desk drawers fill up quickly, and even that space inside your college backpack is valuable, especially with all those bulky textbooks you'll be carrying. As for sound, these college headphones have a built-in microphone that will bring out the best sounds from your iPod, phone, other mp3 players, tablets, or any music-playing device!